From the roof of the mess hall, two prison guards at the Adams County Correctional Center watched in astonishment as dozens of protesting prisoners kicked and pulled at the gates below. Deborah Temple was working her regular shift at the sprawling Mississippi prison, but Catlin Carithers, 24, a member of the emergency-response team, had been called in when the protests began. Now, as the shouting below grew louder, Carithers handed Temple a gas canister and showed her how to use it. Suddenly, dozens of inmates burst through the fence. Others commandeered a ladder and climbed to another roof in the compound. An order crackled over the radio: Deploy the gas. Carithers heaved a canister into the yard. “That is when all hell broke loose,” Temple says. They were screaming in Spanish, which neither Carithers nor Temple could understand. Several were hoisting themselves onto the roof where the officers stood. The last thing Temple remembers before receiving a blow to her head was an inmate she knew from the mess hall saying, “Sergeant Temple, if you tell them to give us what we want, nothing will happen.” When she came to, the tear gas was thick. She could hear helicopters. She turned her head and saw Carithers lying prone a few yards away. Temple was transported to a nearby hospital; she was one of 20 people injured that day in May 2012. At the hospital, a friend delivered the news: Carithers was dead. Temple sobbed. He was young enough to have been her son. The Adams County Correctional Center is a 2,500-bed federal prison, but the Federal Bureau of Prisons doesn't run it. Adams is owned and operated by the Corrections Corporation of America, the country's largest private-prison company, and it's one of 12 private-prison facilities the BOP uses almost exclusively to hold noncitizens convicted of federal crimes. A third of these prisons are run by CCA. 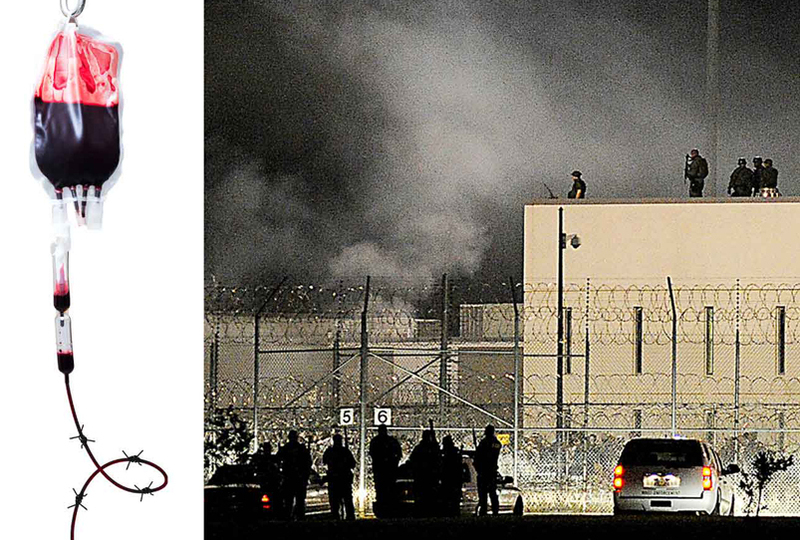 The fatal uprising at Adams was one of four riots to explode in the BOP's private prisons since 2008, all triggered by grievances over medical care. A trove of 20,000 pages of previously unreleased monitoring reports, internal investigations, and other documents obtained through an open-records suit show that the BOP had been warned of substandard care by its own monitors for years but failed to act. In February, The Nation reported that at least 38 men died in the BOP's privately run prisons from 1998 to 2014 in the wake of inadequate medical care. An examination of thousands of pages of previously unreleased files revealed that gravely ill prisoners had been left untreated, or relegated to the care of low-level medical workers. In some facilities, inmates went months without seeing a doctor. Some prisoners who required emergency care were not transferred to a hospital, in an apparent attempt to save costs. In a striking confirmation of these findings, the new records show that BOP monitors documented, between January 2007 and June 2015, the deaths of 34 inmates who were provided substandard medical care. Fourteen of these deaths occurred in prisons run by CCA. Fifteen were in prisons operated by the GEO Group. The BOP didn't respond to repeated requests for comment or to written questions before deadline. Martz, who retired in frustration in 2014 after 25 years with the bureau, says that the BOP's failure to shut down Adams was due in part to a cozy relationship between bureau leadership and private-prison operators, illustrated by a revolving door between the BOP and the industry. In 2011, for example, just a year before the riot, Harley Lappin, who had served as the bureau's director for eight years, left to join CCA as executive vice president. Last year, he earned more than $1.6 million. At least two other BOP directors have also moved on to leadership positions at companies with BOP contracts, and Martz and four other former bureau administrators charge that one or both of them appeared at times at bureau meetings with contractors. “It made things difficult,” he says. This year marks two decades since the Bureau of Prisons' privatization experiment began, under the mandate of a Clinton White House and GOP-controlled Congress dedicated to “reinventing government.” From the start, some BOP officials and lawmakers feared privatization might degrade quality. So two backstops were put in place: Congress ordered studies of the BOP's two pilot programs, comparing their operations to similar bureau-run facilities. And the BOP created a robust monitoring system. It took seven years for the bureau to release its studies on the BOP's first privatized facility, in central California. One study found that any cost savings were eclipsed by the financial burdens of oversight; another took up the question of quality and found a litany of deficiencies, including health services that had barely met standards for nearly two years. The authors warned against the practice of substituting licensed vocational nurses, or LVNs, for more highly trained nurses. LVNs are trained to support registered nurses and nurse practitioners, not to evaluate patients or make treatment decisions. But in the privately run clinic, LVNs were operating as frontline workers, and missing signs of serious illness. The study was prescient. For The Nation's February 2016 investigation, independent medical doctors examined records related to 103 men who died in private federal prisons. They found evidence of LVN overextension in at least 19 cases. By 2005, when the BOP study showed no real savings, the bureau had already contracted with Cornell, the GEO Group, and CCA for the management of five more private facilities. By fiscal year 2015, the BOP's budget for private contractors was over $1.05 billion. The contracts that the bureau has issued are fixed-rate arrangements: The BOP pays a sum, and the contractors manage all exigencies. But the companies' fees — usually tens of millions of dollars annually for each prison — can be reduced if BOP monitors identify recurring or systemic problems. Most contracts are written as 10-year agreements with a four-year base period and three two-year option periods. At each interval, BOP officials have an opportunity to respond to red flags in the monitoring reports by quietly ending a contract. If a facility descends into dysfunction, contracting officials can issue a “cure notice,” which can set a countdown — sometimes consisting of as few as 10 days — for the BOP to shut a facility down. The BOP has never used a cure notice to close a facility, even when the problems continue, according to two contracting officials. The Adams County Correctional Center, on a corner of Hobo Fork Road, an unpaved rural tract lined with mobile homes, was a new facility when Donna Mott began working there in 2009 as the BOP's lead on-site monitor. Mott, then 46, had been with the BOP for 22 years, working her way up from counselor to case manager to a post in the privatization-management branch. Adams was one of her first assignments. By then, the BOP's privatization experiment was headed for crisis. In late 2008 and early 2009, a massive federal prison in Texas called Reeves, run by the GEO Group, had erupted in two riots following an inmate's death. Officials in Washington, DC, soon began contemplating whether to end the contract. Monitoring reports had recently cited other private prisons in Texas, California, and New Mexico for systemic lapses, mostly in medical care. Almost immediately after she was transferred to Adams, Mott began to document serious problems. A “lack of correctional experience” among CCA staff — some had been hired right out of high school — was degrading its operation, she noted in a quarterly report. The company's internal quality-control system was broken. Sanitation in the special-housing units was “extremely poor.” The medical clinic lacked Spanish-speaking staff. Seven months after Adams opened its doors, monitors documented 44 contract violations and two “significant findings” indicating a systemic failure (one in health services). Inmates were not properly treated for HIV, tuberculosis, or other infectious diseases, and sick prisoners' care had been mismanaged before their eventual hospitalization. Mott pressed CCA's local administrators to correct the problems. Yet six months later, the BOP's biannual review by a team of specialists documented 13 “repeat deficiencies,” including ongoing denial of proper HIV care and incomplete medical evaluations for newly arriving prisoners. CCA had been “ineffective” in its efforts to correct these issues, Mott and another monitor later noted. Mott wouldn't discuss specifics about Adams; she says she remains bound by confidentiality agreements. But what's clear from her reports and the medical records is that prisoners were suffering. On December 10, 2010, after monitors documented nine violations related to infectious-disease care in only 17 months of operation, 32-year-old Lucio Gonzalez Perez, a father of four and a field worker arrested on drug charges, was booked into Adams. On arrival, a licensed practical nurse (LPN), similar to an LVN, performed the medical intake. She noted that Perez “appear[ed] malnourished,” but cleared him for work duty. Perez visited the clinic three times with complaints of stomach pain and diarrhea, but he saw only nursing staff. Eighteen days after his arrival, he met with Dr. Ronald Frye, who diagnosed him with acute gastroenteritis and dehydration. Frye ordered IV fluids and medications for nausea and diarrhea. When Perez didn't improve, Frye sent him to a local ER. On January 4, Frye ordered a series of lab tests, including a test for HIV — something that should have been offered, according to BOP medical protocols, when Perez arrived at Adams. A week later, Perez learned that he was HIV-positive. He wasn't prescribed antiretrovirals, though by then it may have been too late. The next morning, Perez was “listless” and “lethargic.” Two days later, he became nonverbal and incontinent. Yet another day passed before the prison transferred him to the ER again. Perez died of AIDS-related illnesses on January 18, 2011, 39 days after he was booked into Adams. One week before his death, he weighed 99 pounds. CCA's mortality review found that “HIV labs could have been drawn sooner” and that Perez's diagnosis was not “appropriate and timely.” Mott issued two formal “notices of concern”; soon thereafter, medical monitors cited Adams for the third time for failing to test the viral-load counts of HIV-positive inmates. Frye, who has since retired, didn't respond to requests for comment. In April, according to monitors, yet another Adams inmate, Hilario Cabrera Trejo, 60, passed away after botched care. He died of a heart attack in an ambulance on the way to the ER — a trip that had been delayed for hours, despite his shortness of breath and EKG changes, because the nurse on duty couldn't reach the facility physician by phone. By March 2012, Villanueva was throwing up blood. The LPN and later a registered nurse contacted Frye, who ordered antinausea medication. The nurses instructed Villanueva to notify them if he were to “continue with vomiting up copious amounts of blood.” Two days later, he reported coughing up more blood, as well as night sweats, chills, fever, and continued pain in the right side of his rib cage. He'd lost 25 pounds since he arrived at the prison in June 2010; his oxygen levels were low, his pulse was elevated, and his breathing was rapid. Villanueva visited the clinic at least six times in four months. Not once did he see a doctor, despite his rapidly deteriorating health. On March 15, 2012, medical staff sent Villanueva to the hospital, where an X-ray showed a huge mass on his right lung. By the time he was diagnosed with lung cancer, it had metastasized to his brain. On May 10, the BOP transferred Villanueva to a federal medical facility for prisoners in North Carolina. Ten days after his departure, the inmates at Adams rioted and Catlin Carithers lay dead. Juan Villanueva died seven weeks later. In the wake of the Adams riot, the BOP conducted an investigation. Ten bureau officials, including Martz, spent days interviewing guards and reviewing documents. The report they produced in July 2012, marked “sensitive,” hasn't been released until now. Short of shuttering a facility, the BOP's primary cudgel is a system of financial penalties that can be imposed for documented deficiencies. But according to Mott, who after two years at Adams was promoted to regional supervisor, these penalties, called “deductions,” were often substantially smaller than what the on-site contracting officials proposed. Sometimes, despite clear deficiencies, no deduction was imposed. “We prepared the deduction-proposal package, sent the deduction-proposal package up, and it was met with 'No,' ” she says. Or a proposed $250,000 deduction would get knocked down to $25,000. Martz would tell her that because a contractor was new, or a prison had just opened, the BOP was giving it a break, Mott says. Or she would be told that the full allowable deductions would impose too great a financial toll on the company. “We entered into these kinds of contracts to make them work,” says Carey Cleland, who worked as an on-site contracting officer at facilities in California and Texas until his retirement in 2012. “We needed them because they had the beds.” Cleland says that his deduction plans, based on an established formula, were often undercut by Martz's boss, Matt Nace. “He would lower them, and lower them significantly,” Cleland says. Like many federal agencies, the BOP was encouraged under both the Clinton and Bush administrations to move away from an us-against-them mode of contract management and toward a partnering model. Monitors were to adopt a collaborative approach to resolving problems with contractors, according to internal documents. That approach, Mott and Cleland say, produced a system of “horse trading” in which company officials would negotiate their way out of deductions. After BOP Director Harley Lappin departed for CCA in 2011, Martz says, BOP Assistant Director Bill Dalius, the bureau's CFO, would frequently mention conversations with Lappin in BOP meetings about contracting decisions. “Dalius would say, 'Harley said so and so,' or 'I heard from Harley,'” Martz says. When, after the riot, Martz moved to end CCA's contract at Adams, it was Dalius, he says, who blocked his proposal. “If that relationship between the assistant director and the former director didn't exist,” he says, “I don't believe that the first [option] period would ever have been exercised.” CCA's Burns says that Lappin has followed ethics laws in his interactions with government officials and that “it is unequivocally false to state or imply that contracts were inappropriately extended or influenced during his tenure.” Dalius claims that Nace, his subordinate, had “final authority” over all contracts. Two other former BOP directors, J. Michael Quinlan and Norman Carlson, joined CCA and the GEO Group, respectively. Martz recalls that Quinlan, who has been a CCA executive since 1993, “would come and try to influence the decisions being made.” Officials who served in the early years of contracting say the same about Carlson. In October 2015, Dalius left his job at the bureau too. Within days, he had launched a new firm, Perimeter Management Consulting, which counts CCA as a client. As with the riots at Adams and Reeves, investigators found that BOP oversight had been lax. In Willacy's first three years of operation, monitors issued 50 notices of concern. In that same period, officials imposed only seven deductions. Other deficiencies — including Willacy's failure to fully staff its medical unit — elicited only mild letters of inquiry. Following the riot, officials emptied Willacy and permanently relocated the inmates. But closing one of these prisons is rare: Apart from Willacy, the BOP has shut down only two facilities before their contracts ended. The records we obtained correspond with contract activations, renewals, or extensions for 16 facilities between 2007 and 2015. Collectively, they cover 53 decision points. Twenty-eight of these — more than half — came after the latest monitoring report indicated at least one repeat deficiency or a “significant finding.” Nineteen were in health services. The Cibola County Correctional Center, a CCA facility in New Mexico, has accumulated more repeat deficiencies or significant findings in health services than any other private federal prison currently in operation. Since 2007, 30 of its 34 citations related to medical care. Cibola was one of the BOP's first experiments with noncitizen prisons. In 2001, shortly after the bureau inked a contract with CCA, inmates staged a protest. CCA guards responded with tear gas. In 2009, experts identified repeat deficiencies in Cibola's clinic. Yet in 2010, the BOP signed a second 10-year contract with CCA. The facility soon plummeted into disrepair. In March 2011, the on-site monitors issued a notice of concern after the death of a prisoner: The facility had finally hired a doctor, but for at least three months he had not examined a “deteriorating” inmate who later died of cancer. By 2012, Cibola was again without a physician. The nursing staff was “working without clinical guidance,” monitors wrote. By April 2014, Cibola was in crisis: Monitors logged 11 repeat, double-repeat, or triple-repeat deficiencies and flagged another significant finding in health services: “Many issues from previous monitorings have not been corrected.” Cibola lacked a fully staffed medical department for months at a time. 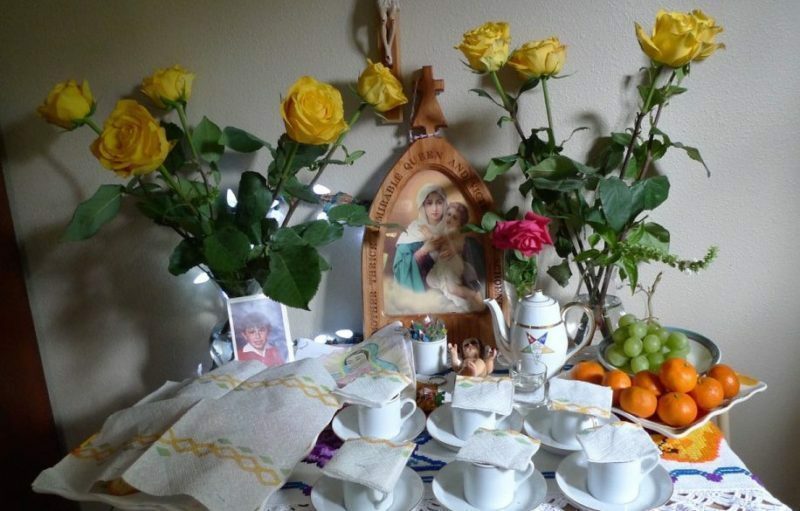 In July 2014, Blas Humberto Gutierrez-Lujan, 44, collapsed in his cell. The LPN who responded did not remain in the cell to perform CPR. Twenty-six minutes passed before emergency responders arrived. “Earlier intervention is crucial in the management of cardiac arrest,” the monitors wrote. Gutierrez-Lujan died later that day, at a local hospital. Two months later, the BOP extended CCA's Cibola contract for another two years. In October 2014, one month after the renewal, medical monitors returned. They found five uncorrected problems they had identified on previous visits. For a fifth consecutive time, the prison wasn't properly treating TB-positive inmates. For the third time, HIV care was found to be inadequate. 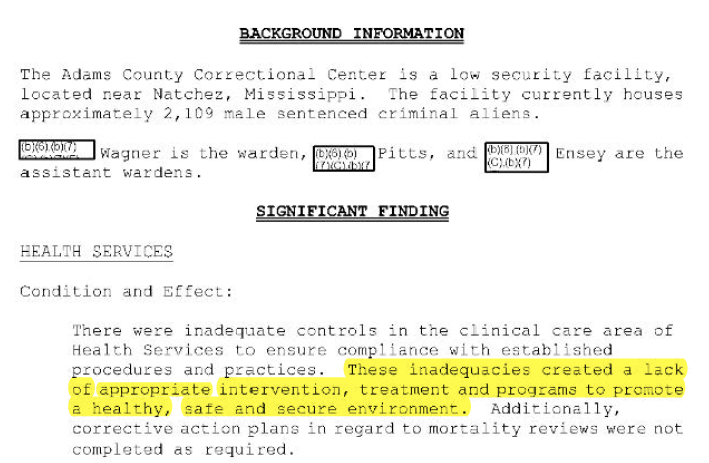 For the fourth time, monitors found that inmates were not receiving proper health assessments. In March, another new inmate arrived at Cibola, 39-year-old Jelacio Martinez-Lopez. He came with a form from the US Marshals indicating that he had been on suicide watch at a facility where he'd been held previously. Yet Martinez was not immediately seen for a mental-health evaluation. Twelve days later, guards found him dead, hanging in his solitary cell. The BOP's review, and then CCA's own internal postmortem report, concluded that he should have been evaluated and treated within two days of his arrival. In April, when the monitors returned, they listed the failures preceding Martinez's death as a repeat deficiency. Yet CCA still operates the prison today. This September, the facility will be up for another two-year extension. The BOP has issued only five cure notices to its private-prison operators since 2007. Not once has the BOP terminated a contract for default. Donna Mott retired in January 2014. Not long after her departure, the Department of Justice's inspector general launched an investigation into how the BOP monitors its contract prisons. It also announced an audit of CCA's management of Adams. Neither report has been released. But monitoring reports at Adams have shown signs of ongoing dereliction. In January 2015, monitors found that at least five inmates had died in the preceding year in the wake of substandard medical care. The monitors issued yet another significant finding in health services. Perhaps because federal watchdogs were now paying attention, contracting officials in Washington imposed a large, $811,000 deduction. Then the contract was quietly extended for another two years. Editor's note: A previous version of this story attributed to Doug Martz allegations that former Bureau of Prisons director Norman Carlson attempted to influence the bureau’s contracting decisions after joining the leadership of a private prison company. Other former contracting officials at the BOP charge that Carlson influenced decisions, but Martz did not make that claim.